Have you learned how to make Thanksgiving dressing recipes? 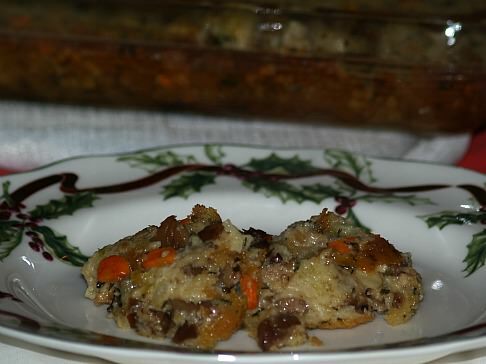 Many people call these recipes stuffing. I have always cooked my dressing in the pan of broth which came from the turkey therefore not “stuffing” the turkey. My family has always called this recipe dressing for this reason. I love the added flavor and moistness which comes from cooking it in the broth. 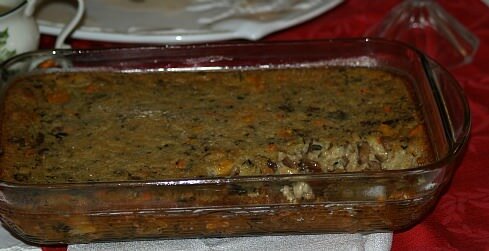 If you are one who likes a drier stuffing, you might prefer it cooked inside the turkey. Mom learned how to make the best Thanksgiving dressing recipe that I have ever eaten; everyone loved it. It was so moist and well seasoned. When asked what made her recipe so good she would tell them it had to have plenty of fresh eggs, plenty of good butter and well seasoned with salt, pepper and sage is a must. There were always so many for dinner that she made a lot using several loaves of bread; the following is how to make a smaller portion. Dry a large loaf of sliced bread for several days; should all be dry and very stiff. Break bread into small pieces; soak bread with milk and set aside to soak it in. (make sure all bread gets soaked). Sauté 2 large finely chopped onions and 3 large finely chopped stalks of celery in 1 to 2 cups melted butter until vegetables are tender; add to bread. Beat 8 eggs and add to mixture; add ½ teaspoon black pepper, 1 teaspoon salt and 1 tablespoon ground sage. (Adjust seasoning if desired). Blend all ingredients well; dump into pan with turkey broth and bake in preheated oven until done. (About 1 hour). Learn how to make Thanksgiving recipes with cornbread; they are popular in the southern United States. Soak cornbread and sandwich bread in chicken broth and water in a large bowl about 10 minutes. Stir mixture until liquid is absorbed. Sauté onion and celery in butter until tender. Add sausage and cook over low heat until sausage is browned; drain. Add sausage mixture, eggs, sage and pepper to bread mixture; stir well. Spoon dressing into lightly greased 9 X 13 inch baking pan. Bake in preheated oven at 350F degrees for 1 hour or until lightly browned. This Thanksgiving Dressing Recipe is very easy to make. Good for stuffing turkey, wild duck or other poultry. This Thanksgiving Dressing recipe was always my husbands favorite. Cover oysters with water and heat until steaming; strain and remove oysters reserving liquid. Soak 1 quart biscuit crumbs with hot liquid making sure there is enough to soak the crumbs. 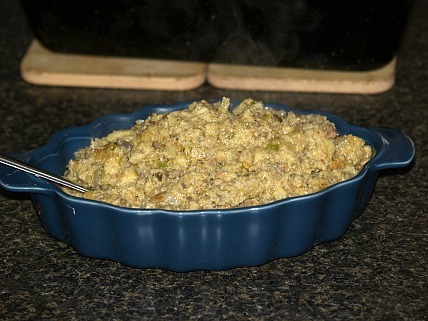 Add eggs, salt, pepper and oysters to mixture; mix and stuff loosely in turkey cavity. There will more dressing than what is needed to stuff turkey. Shape remaining in patties and brown well. When turkey is done serve around turkey on platter. Grind dry herbs together and allow to stand in warm melted butter for 15 minutes. Add salt and pepper; lightly toss with seasoned butter mixture and bread crumbs. Add milk, celery and onion and blend; stuff lightly into bird and place in oven to roast. Recipe for 10 pound bird. Cook chestnuts until very tender; put through colander. Add butter, cracker crumbs, salt and pepper; add enough cream to moisten. Combine cornmeal, baking powder, baking soda and salt in a large bowl. Add and blend 2 eggs, buttermilk and melted bacon drippings. Place well greased 10 inch cast iron skillet in hot oven at 450F degrees for 4 minutes until hot. Remove skillet from oven and spoon batter into skillet; bake for 35 minutes or until lightly browned. LOWER OVEN TEMPERATURE TO 350F degrees. Cool and crumble cornbread into a large bowl. Sauté celery and onion in butter until tender; add to crumbled cornbread. Add remaining ingredients and blend well; spoon into lightly greased 9 X 13 inch baking pan. Bake at 350F degrees for 25 to 30 minutes. Chestnuts add a slightly sweet taste to this recipe; with the flavor of spices and vegetables, it makes a very good Thanksgiving dressing recipe. Preheat oven to 350F degrees; grease a 9X13 inch baking dish. Sauté in melted butter the onion, celery, carrot and bell pepper until vegetables are tender. Set vegetables off of heat to cool. 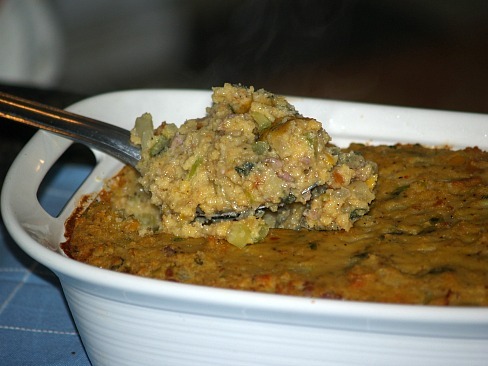 Crumble bread crumbs in a large bowl; add the chopped chestnuts. Pour cream over the bread and chestnuts; add the chicken broth. Add the vegetable mixture to the bread mixture; add thyme, eggs, garlic, salt and pepper. Blend mixture well; spread mixture into prepared baking dish. Bake about 60 minutes; serve hot.